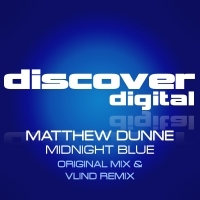 Matthew Dunne returns to Discover Digital with 'Midnight Blue', his follow-up to last Summers superb production 'Splint'. 'Midnight Blue' is an absolute storm of a track. Dunne's original combines melody and intense riffs for a finely-crafted dancefloor smash with one of the most memorable chords we've heard this year. Mexican producer Vlind helps round out this package with a truly unmissable remix. 'Midnight Blue' is available now from Beatport and iTunes.